Watching over the Hobbits from the shadows is Strider, a grim yet noble Ranger, wanderer and swordsman, and friend to Gandalf the Grey. Under his guidance and protection, the Hobbits are led by secret ways to the scarred hill of Weathertop, where he proves the manner of his mettle, standing fearlessly between Frodo and his five terrifying pursuers. 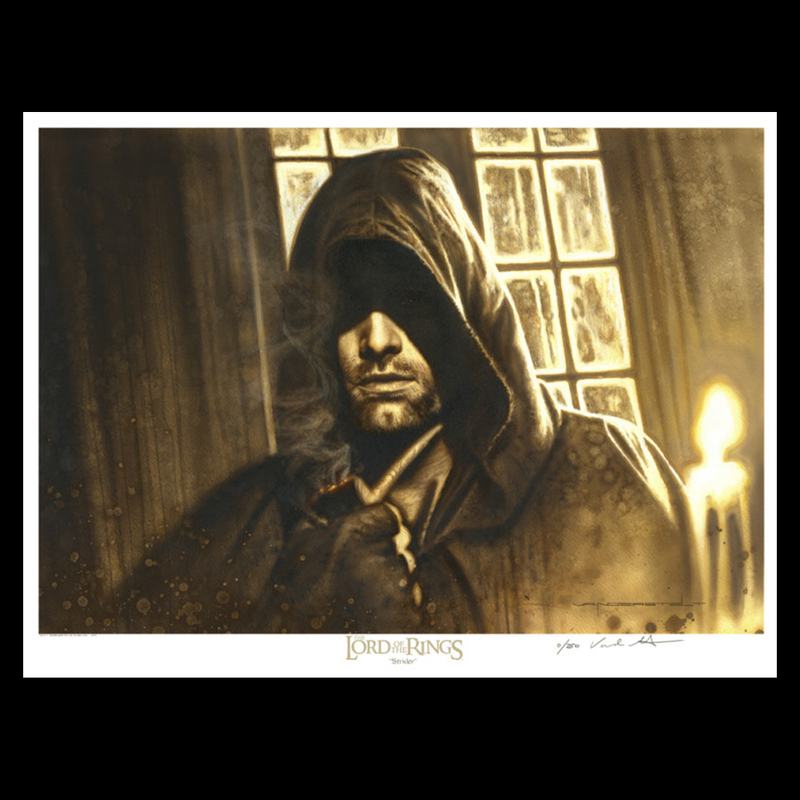 Strider joins a range of gorgeous art prints and lithographs by Jerry Vanderstelt. Tolkien's world of Middle-earth is a far-reaching story of sweeping landscapes and breathtaking castles set deep in its own detailed and ancient history. Along with its many stories, races and tales of war and honour, the books describe cities and castles equally as rich and detailed as the characters who live within them. This beautiful PAPER GICLEE is printed using the finest materials available, utilizing archival inks as well as Breathing Color's "Elegance Velvet" Fine Art paper. It comes signed and numbered by the artist with a Certificate of Authenticity. Strider comes in a Limited Edition of 250.